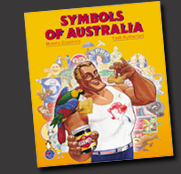 Originally published in 1980, Symbols of Australia has been issued in five slightly different editions. There are still copies left of the last edition– the 20th Anniversary Edition (ISBN 0-646-40309-5) released in 2000. This is a jacketed, hard back, section sewn book measuring 28.7 cm x 25.8 cm (11.25 in x 10.20 in). On its 208 pages it features over 1700 trademarks, including 100 in full colour. It is introduced with essays by Geoffrey Blainey and Phillip Adams. You can purchase Symbols of Australia for AU$48.50 each, including postage and handling within Australia. For customers living outside of Australia, additional postage charges will apply. Use the email form below to tell us which country you live in and we will advise you of postage costs for your country. We aim to ship within 3 working days from receipt of order and clearance of payment. Please fill in the form below and we will contact you to fulfill your order.